That is a very heavy chest with beautiful letter from an administration building. It is a historical piece and a part of the custom made objects they designed for administration uses. It has a very strong patina and beautiful proportions. That is a unique piece and great to put on a table or console. 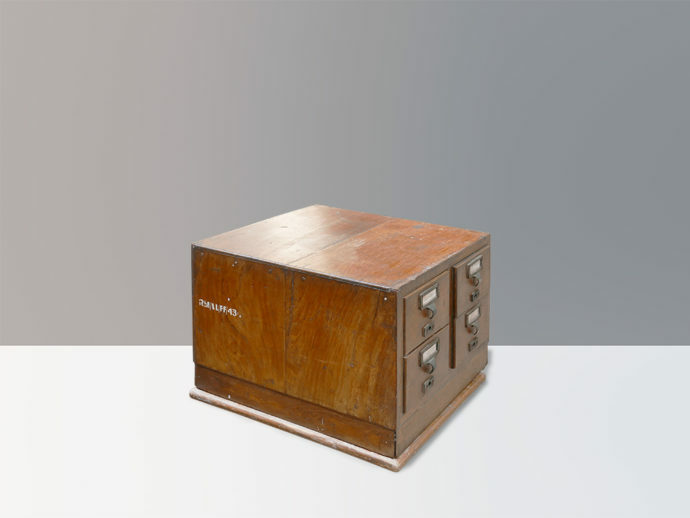 Pierre Jeanneret chest from Chandigarh. Fashion and design are inspirations for all artists. Also finally one of the artefacts we love. Design in Paris makes so much sense to us. We really need that time aspect of design. That chest of Pierre Jeanneret is a great teak and cane piece. It is done to impress. It should be here. So you can put the dirty laundry in it. Architectural pieces from Chandigarh are very rare. They are very nicely done. With brass it looks also great. Finally interior architects love it. Andy Warhol loved Le Corbusier. He travelled to Paris and also finally to London. The design is a contradiction of pleasure. Marina Abramovic is a famous artist. We sell design of her. Great collection of wood pieces. And Tom Strala too. Teak is a fantastic material. That is by Pierre Jeanneret and his sofa. Pierre Jeanneret furniture in best quality. Finally buy design furniture.